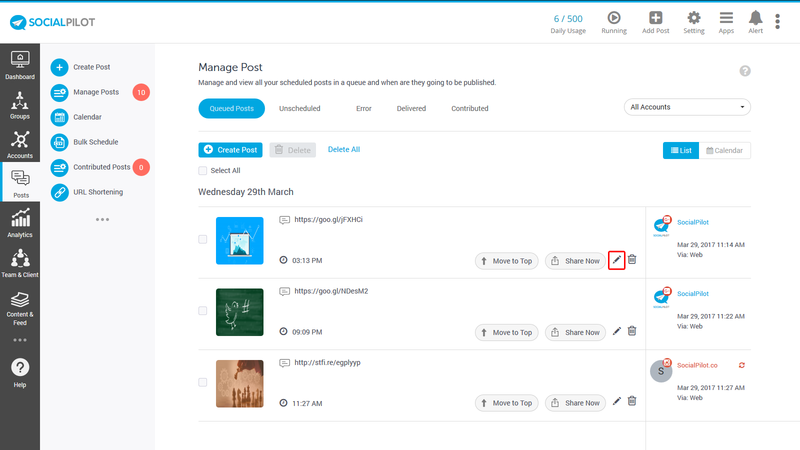 The 'Manage Posts' tab in SocialPilot allows you to edit, re-schedule, shuffle and much more. How to edit a queued post? How to copy posts from one account to another? How ‘Move to Top’ button works in the Queued Posts tab? How to re-share a post once it is published? Click on 'Posts' -> Manage posts, from the sidebar menu. You'll see all your created posts in 'Manage Posts'. Find the post you wish to edit and click on the 'Edit' icon as shown below. An 'Edit Post' pop-up will appear. Here you can make changes to the text and attachments (images, video, GIF). After you're done editing, click on the 'Update' button. Your changes will be saved successfully. Say you have created a post for one account and want to share the same post from another account. The 'Copy To' feature allows you to copy all your scheduled posts and schedule them from other accounts. Select the posts you want to copy, one by one. To select all the posts in the queue, just click on the 'Select All' checkbox. You'll find a 'Copy To' button. Click on it and select the accounts you want to copy these posts to. Note: These copied posts will have the same time schedule as they were set for in the queue. How does the 'Move to Top' button work in Queued Posts? 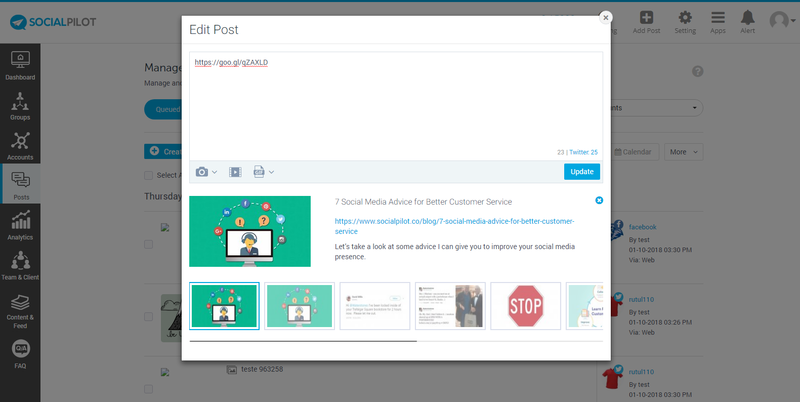 The 'Move to Top' button in your Queued Posts is to let you move a post to the top of your list, for that particular social account. Let's suppose you have scheduled 4 posts for your Twitter profile and 4 posts for your Facebook Page. Now, you want to move the Facebook Page's post to the top. So, clicking on the 'Move to Top' button will move this post to the top of your scheduled post list for Facebook Page (not to the top of your queue). You must re-share evergreen content - the content which performed really well. You can re-share this content to get more engagement and traffic. Note: SocialPilot doesn't store your posts for more than the above-mentioned time period. Click on ' Manage Posts' -> Delivered tab. You’ll find the 'Reshare Post' button beside every published post. Click on the button to edit and schedule it again. Select the account(s) from which you want to publish the post and click on the 'Add To Queue' button. Export your posts as a CSV - You can save all of your published posts in the form of a CSV and re-schedule it to your social media profiles using our Bulk Scheduling feature. Save it as Drafts - To save your published posts as drafts, click on the 'Reshare Post' button and then click on the Save as Draft button. The posts will be saved as drafts for you to schedule/share later. Go to your social media profile, find the post you wish to re-share and use our Browser Extension to add it to your queue. How does the 'Export as a CSV' feature work? The 'Export as CSV' feature lets you download all the posts - ones in the queue, ones that have been published, ones that have errors, and ones in the 'unscheduled posts' tab. As you click on the 'More' button, you'll find 'Export as CSV' from the drop-down. And your CSV will be downloaded. You can schedule these posts later by just uploading this CSV.